Donovan Dale may have a Canadian Football League (CFL) career ahead of him, but he is already planning for life after football. 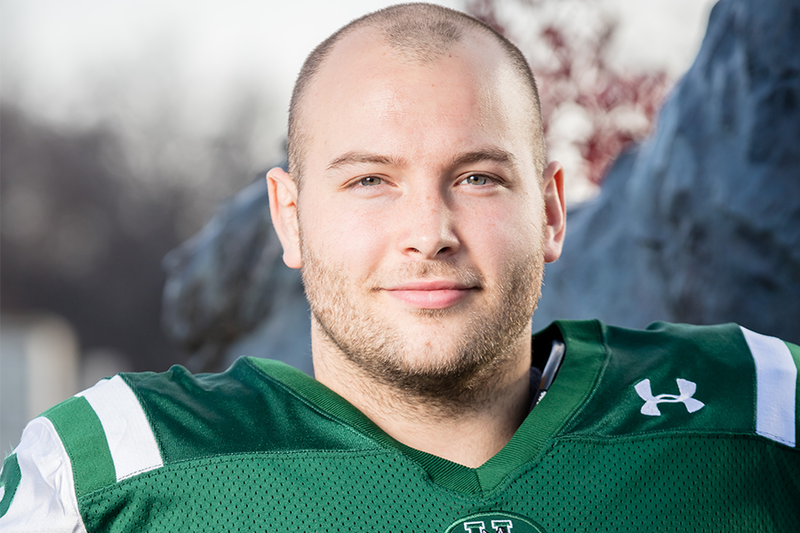 The University of Saskatchewan Huskies all-star's passion for tackling training is matched by his off-field commitment to hitting the books as he works towards completing a master's degree at the U of S.
"I am pretty aware of the fact that the average pro football career is actually just a year or two, so you can't just sit back and say I am going to have a 10-year career in the CFL and then not have any plans for after that," said Dale, a 24-year-old kinesiology student from Saskatoon. "That's why it is definitely important for me to make sure that I still continue with my education and make sure I get that master's finished." A formidable force on the defensive line, the 6-foot-1, 290-pound Dale finished first in the Canada West conference (and fourth in the country) with eight quarterback sacks in eight games on his way to earning his third straight all-Canadian award. Originally passed over in the CFL draft in 2015, Dale signed his first professional contract in March after being added to the Ottawa Redblacks' negotiation list. Dale went to Ottawa last month to take part in Redblacks mini-camp and is now a CFL free agent able to sign with any team, after being released by Ottawa on April 27 following its spring camp. While he would love to have Dale back for a fifth and final season with the Huskies, head coach Brian Towriss believes Dale may have an opportunity to play in the CFL this year. "We would like to have him back for another year as he finishes his master's degree, but if he has an opportunity to play pro, it has been a lifelong dream and he can certainly pursue his education on top of that," said Towriss, who has sent plenty of players to pro during his 32-year career as Huskies head coach. Dale graduated with great distinction (for an average of better than 80 per cent) with a Bachelor of Science in kinesiology from the U of S last spring. Dale split his semesters between Saskatoon and Vancouver for two years while attending both the U of S and University of British Columbia as part of Canada's visiting student program and suited up for the Thunderbirds football team for two seasons before returning to the U of S full-time last year and joining the Huskies. A master of multi-tasking, Dale's dawn-to-dusk daily duties have been daunting, but he has excelled both on and off the field while juggling sports and studies, training and textbooks, while also working with young athletes in the evenings as a strength and conditioning coach. If that wasn't enough, he also became a parent last month, after his wife Charissa gave birth to their daughter Evie. "I think I get maybe an hour of free time in a day," said Dale, who wrote his final exams last week. "It's definitely busy, but I knew coming into this that it was going to be like this and I don't like to complain about being busy because I know there's a lot of people who would kill for the opportunities that I've got." The dictionary-definition of a true student-athlete, Dale has been a remarkable role model for the Huskies. "Donovan is a good student and he's in a little bit different place in his life than a lot of our kids," said Towriss. "He is married and has a child and he has been more than just a student-athlete here. He has a good work ethic, he has his priorities straightened out and he has learned to manage all of those things … He is a good role model." While he hopes to be the next Huskies player to play professionally, Dale's commitment to both academics and athletics sets an example to follow for young players in the program. "A lot of times you are getting a scholarship to play football, so you are getting an opportunity that a lot of students don't get to get your tuition paid for while playing, and you see that squandered a lot of time," said Dale, who is determined to complete his second degree while also playing in the CFL. "The nice thing for me is the master's program that I am in is course-based as well as thesis-based, so this first year of my master's I actually took care of all of the course work … I can just continue to work on my thesis and research in my free time while playing football." ○ U of S football spring camp kicks off Thursday, May 5 at Griffiths Stadium, under the direction of longtime Huskies head coach Brian Towriss—the longest-serving active university football coach in the country. Spring camp wraps up with an intrasquad game on Sunday, May 8 at 10:30 am. ○ Saskatchewan Roughriders head coach/general manager Chris Jones and TSN's CFL analysts Glen Suitor, Jock Climie, Duane Ford and Rod Smith will headline the 16th annual Huskie Football Foundation's Dog's Breakfast scholarship fundraiser May 5 at Prairieland Park. Go to huskiesfootballfoundation.com for tickets. ○ After capturing the CIS championship, Huskies women's basketball coach Lisa Thomaidis now turns her attention to coaching Canada's national team, with tryouts starting May 21 in Edmonton. Huskies' all-Canadian Laura Dally—the Canada West conference most valuable player and U of S female athlete of the year—is expected to be among the players invited to battle for a chance to play in the Summer Games in Rio de Janeiro, Aug. 5-21.